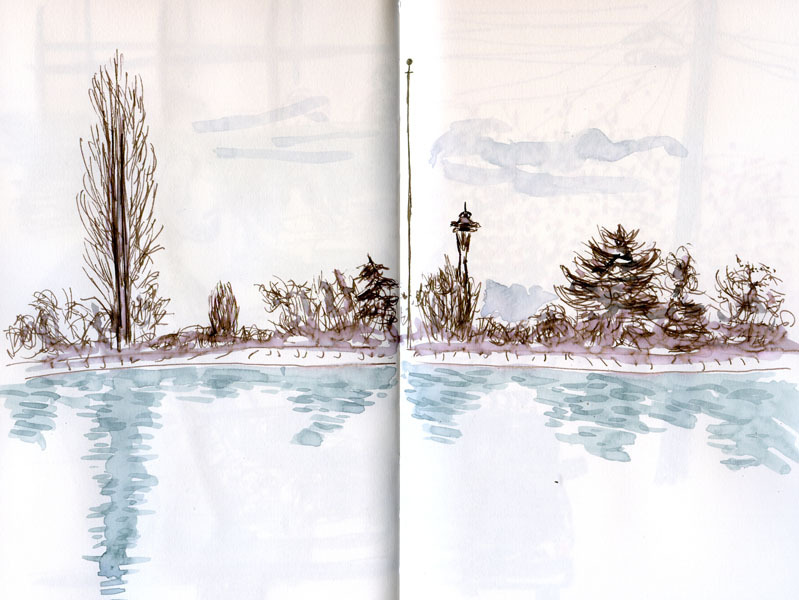 Among Volunteer Park’s many treasures (which include the Conservatory, the historic water tower and the Seattle Asian Art Museum) is a quintessential Seattle viewpoint: the Space Needle framed by the Isamu Noguchi sculpture Black Sun. 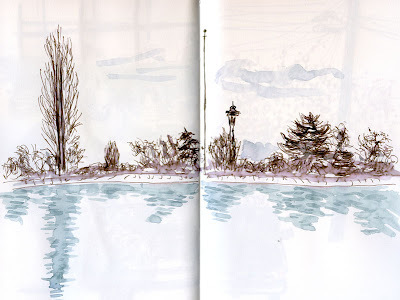 During the 30 minutes or so that I took to sketch the view of the Needle, which was dwarfed by the park’s many types of trees at the edge of the reservoir, at least four parties of tourists came by for a Kodak moment. Typically one person in a party would pose in the donut hole of the Noguchi sculpture while a companion snapped the photo (surely destined for Facebook). Another popular pose is holding one’s hand up, as if supporting the Needle. What amused me was how quickly these tourists snapped their photos and then left, all within the course of a minute or less, hardly even viewing the view. I guess that's why it's called a Kodak moment. I like this a lot, Tina. And your text also makes me smile.